Ten years ago the Cassini probe made a New Year’s Eve close approach to Saturn’s moon Iapetus and captured astonishing views of its remarkable surface. Four visible light images were put together to form this global view. 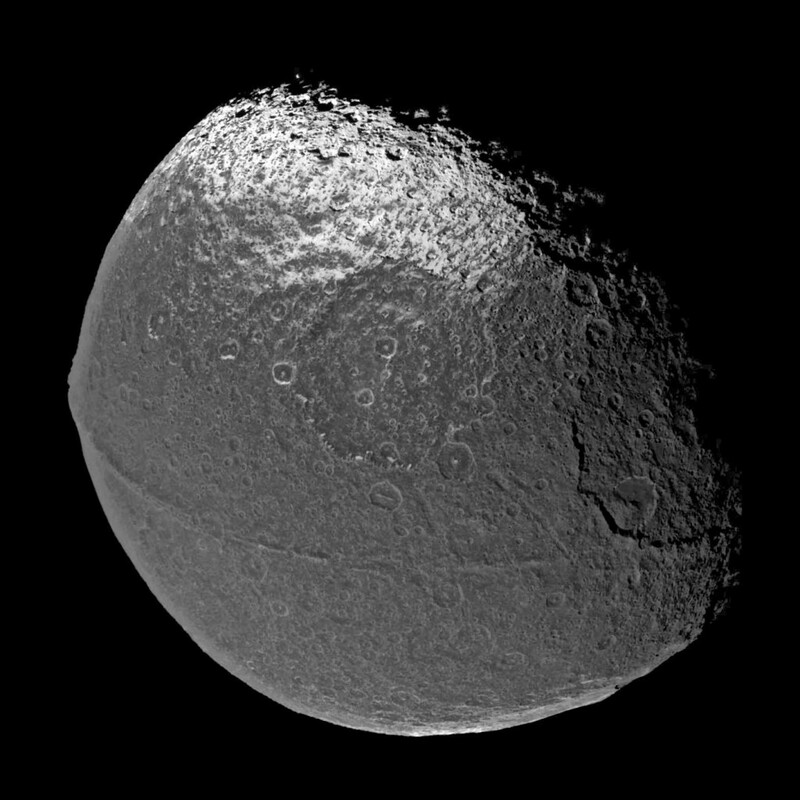 The scene is dominated by a dark, heavily-cratered region, called Cassini Regio, that covers nearly an entire hemisphere of Iapetus. Iapetus is 1,436 kilometers (892 miles) across. 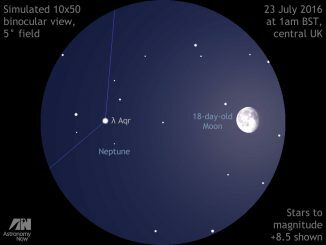 The view is centred on the moon’s equator and on roughly 90 degrees west longitude – a location that always faces the direction of Iapetus’s orbital motion around Saturn. Within Cassini Regio, and especially near the equator, dark deposits with a visual reflectivity of only about 4 percent coat nearly everything with remarkable uniformity. However, at latitudes of about 40 degrees, the surface transitions to a much brighter, icy terrain near the pole where the brightest icy materials have reflectivity over 60 percent. However, this region is not uniform: Close inspection reveals that the surface is stained by crudely north-south trending wispy streaks of darker material, typically a few kilometres wide and sometimes tens of kilometres long. An ancient, 400-kilometre wide (250 miles) impact basin appears just above the centre of the disc. The basin is heavily overprinted by more recent, smaller impact craters. The basin rim is delineated by steep scarps that descend to the basin floor. Many of these scarps, as well as walls of nearby craters, appear bright, probably due to exposed outcrops of relatively clean ice. Particularly at mid-latitudes, the brightest scarp exposures appear to face away from the equator (i.e. toward the pole). Often, the opposite south-facing scarps are stained with the lower-brightness material. The most unique, and perhaps most remarkable feature discovered on Iapetus in Cassini images is a topographic ridge that coincides almost exactly with the geographic equator. The ridge is conspicuous in the picture as an approximately 20-kilometre wide (12 miles) band that extends from the western (left) side of the disc almost to the day/night boundary on the right. On the left horizon, the peak of the ridge reaches at least 13 kilometers (8 miles) above the surrounding terrain. Along the roughly 1,300 kilometre (800 mile) length over which it can be traced in this picture, it remains almost exactly parallel to the equator within a couple of degrees. The physical origin of the ridge has yet to be explained. It is not yet clear whether the ridge is a mountain belt that has folded upward, or an extensional crack in the surface through which material from inside Iapetus erupted onto the surface and accumulated locally, forming the ridge. The origin of Cassini Regio is a long-standing debate among scientists. One theory proposes that its dark material may have erupted onto Iapetus’s icy surface from the interior. 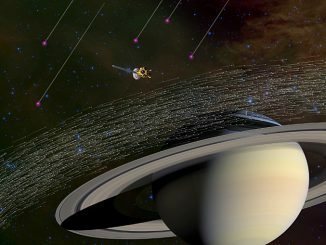 Another theory holds that the dark material represented accumulated debris ejected by impact events on dark, outer satellites of Saturn. Details of this Cassini image mosaic do not definitively rule out either of the theories. However, they do provide important new insights and constraints. Cassini acquired the images in this mosaic with its narrow angle camera on December 31, 2004, at a distance of about 172,400 kilometres (107,124 miles) from Iapetus and at a Sun-Iapetus-spacecraft, or phase, angle of 50 degrees. The image scale is 1 kilometre (0.6 miles) per pixel. 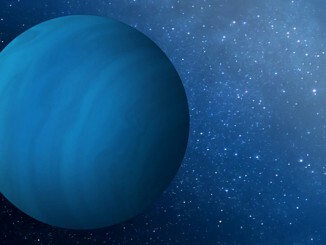 The image has been contrast enhanced to aid visibility of surface features. NASA’s Cassini spacecraft has been in orbit around Saturn since 2004, studying the giant planet, its rings and its moons. Among the myriad microscopic grains collected by Cassini, a special three dozen stand out from the crowd. Scientists conclude these specks of material came from interstellar space — the space between the stars.